Yes, Enroll My Child For a 1 on 1 One Hour Online Tutoring Session! 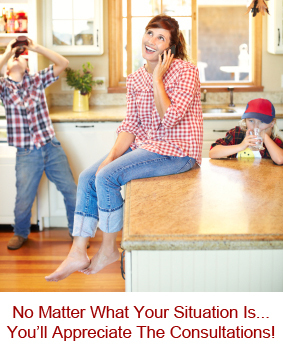 You Can Stop Struggling To Help Your Child - Right Now! You don’t need to fight a battle every night that causes turmoil. All you need… is to tap into learning strategies that leverage your child's current interests. How do you avoid all of the arguments… the time… and then suddenly… and I do mean SUDDENLY… your child starts to achieve test scores like top performing students? The answer is simple...hire your own personal TutorFi tutor! We created the TutorFi to ensure each tutor who gets our "certified" seal of approval is indeed ready to commit 110% effort to help every parent and student the most out of their customized online tutoring program. You won't just get a qualified tutor, you'll also get a tutor who cares and will personally consult with you before & after your child's session. 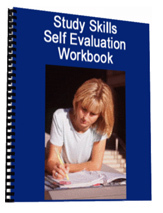 This will allow your son or daughters first tutoring session to be more effective than you ever expected. And of course your satisfaction is 100% guaranteed. What we've learned along the way is this: Traditional teaching methods don’t work for many of today’s kids. Is your son or daughter excited about learning? They're probably not. The main reason for this is simply boredom. They're bored in school and it's hard for them to stay focused when they are bored. Instead of trying to convince you that technology is taking over, I prefer you hear it from the horses mouth. If you are struggling to help your child keep up in school, you'll really appreciate this video as it offers a simple solution to turning around the current academic slump your child might be going through. After watching the video above, you'll probably agree that most kids in a traditional school are bored with the teachers and the entire traditional learning process. This alone can be the #1 reason your child is struggling to keep up. Kids these days "expect" entertainment more than ever. By stimulating the learning process in a more entertaining way by using multimedia you can expect break through results. By plugging engaging elements into the learning process, it becomes more fun. And that means they are willing to spend more time learning. Webopedia defines multimedia as - use of computers to present text, graphics, video, animation and sound in an integrated way. Your personal TutorFi tutor is trained and ready to help your child create the academic breakthrough you've been dreaming of! So How Do You Tie These Principles Together? Did you watch the virtual tour? Please watch it before reading on! TutorFi.com has enriched the education of countless kids with our online tutoring classroom and our unique tutors who over deliver in ways the others can't. It’s our passion to consult with you personally and combine the latest in tools and technology… to deliver a uniquely effective solution to tutoring. The TutorFi we created allows our certified tutors to teach kids without leaving home… and we have achieved exceptional results. Imagine the positive changes in your child’s attitude, desire and habits… once they work one-on-one with their own private online tutor while sitting comfortably on the computer they love. It doesn’t matter if your son or daughter is in 4th grade… or high school. We’ll hand-pick a TutorFi tutor who will match perfectly with your son or daughter. Some of the finest educators from across the country are apart of our extraordinary team. This is tutoring like you’ve never seen before! Sure, there are other tutoring options which I outlined above and one of those options might be right for you. But if you want a more tailored experience with tutors who really care … plus the added comfort of us overseeing the process, keep reading and I’ll tell you how it all works. Since 2003, when we first got started with our online tutoring service, we found out quickly that tutors who worked for us did not care as much as much as me and my team did. The solution was right in front our eyes, but it took a while to see it. 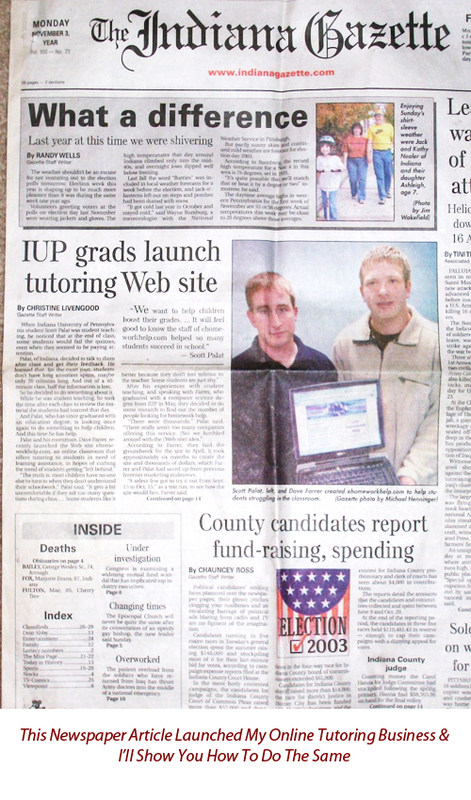 When I launched my first website, the local newspaper picked our story up immediately and put us on the front page (Click Here To See The Original Newspaper Article). We were the talk of the town and soon the internet! After my initial launch and success, I opened up another popular tutoring website on my own. Tutors were begging for online tutoring jobs daily. After hiring and overseeing dozens of tutors with two different websites, I learned that tutors who just saw it as a job never over delivered and never cared to the level that I desired. I believed back then as we still do now... that a tutoring service should offer real tutors who care and consult with the parents on an ongoing basis. It's my goal to help parents feel like they have their own personal academic consultant. This is why I decided to stop hiring tutors! I ended up recruiting the best and most experienced tutors who shared my passion. We put together a certification program to guarantee only the best tutors make it through. Then and only then are they able to start their own practice with our TutorFi certified seal of approval. Once this model was in place, it was an instant success. Each tutor instantly cared, because it was their business to care. When they started tutoring their own students, they couldn't help but over deliver and give parents a long list of reasons to appreciate their unique service. We've come along way since 2003, but one thing for sure is that our tutors will give you and your child a personal experience unlike any other tutoring option out there... GUARANTEED! Once you enroll your child into our special 1 hour tutoring introductory offer, my team and I will go to work for you. We'll start by calling you directly and taking the time to understand your child's academic situation along with your goals as a parent. Then we'll provide you with the perfect tutor hand picked from our pool of TutorFi certified tutors. Once we decide on your tutor, we'll contact them and review the information you provide us at the time you sign up. Your tutor will call you directly to get started. And that's not all...you'll be amazed how much your tutor over delivers to you and your child. We instructed each TutorFi tutor to provide you with $296 worth of free bonuses before your child even has their first 1 hour tutoring session. That's how committed we are to your child's success with our program and your satisfaction as a parent. You can count on your tutor to care about your child's academic success more than any other teacher or tutor you ever dealt with before. This is our guarantee to you! It's been a long road to get this far. After receiving my education degree in 2003, my teaching career did not last long, because I noticed how many students were being left behind by our current educational system. I had no choice but to leave behind my childhood dream of becoming a teacher or I would have been forced to teach the way the administrators wanted, but not the way I knew was most effective for the students. Let me explain... during my student teaching experience at Indiana Area Junior High School, I saw first hand how excited and attentive non interested students got when I took them to the computer room for interactive lessons I created online. I tried this new approach because almost half of my class was failing and they didn't care about learning from the textbook. Over the next 6 week period, I continued to teach in the computer room instead of boring the class with my lectures. When it was all said and done, I got most of the failing students to not just pass, but get A's & B's...and no I did not offer any type of grading curve. My teacher Mark was so impressed with the results, he couldn't help but brag to other teachers about my breakthrough. After I finished student teaching, I couldn't get this amazing experience out of my mind and I knew I had to make drastic changes in my life. So instead of taking a teaching job, I focused on building an online learning system designed to help students learn online with a real live tutor on the other end. After creating the online tutoring classroom, I launched eHomeworkHelp.com in 2003. We helped students from every grade level including learning disabled and accelerated students. The problem with my first service was that the sporadic homework help did not allow us to get to know the parent or the student. The student just hopped on our website anytime to get help with one of our dozens of tutors, but there was no ongoing communication. It was unfair to the parents, the students, and even the tutors who rarely helped the same student twice. I terminated eHomeworkHelp.com in 2004. In mid 2004, OwlOnlineTutoring.com was launched as the first online tutoring service who cares. This website was an immediate success because we took the time to consult with the parent and match each student with a tutor who continually worked with them. Soon after launching this type of tutoring service, the word spread quick and parents were raving about the service we provided. We were forced to hire tutors to help us keep up with the demand. This is when we learned that "caring" can't be taught. It has to be a desire from within the tutor. So in late 2006, we created TutorFi.com and now we pride ourselves on "Taking The Time To Care"& "Over Delivering" in education for students of all ages. 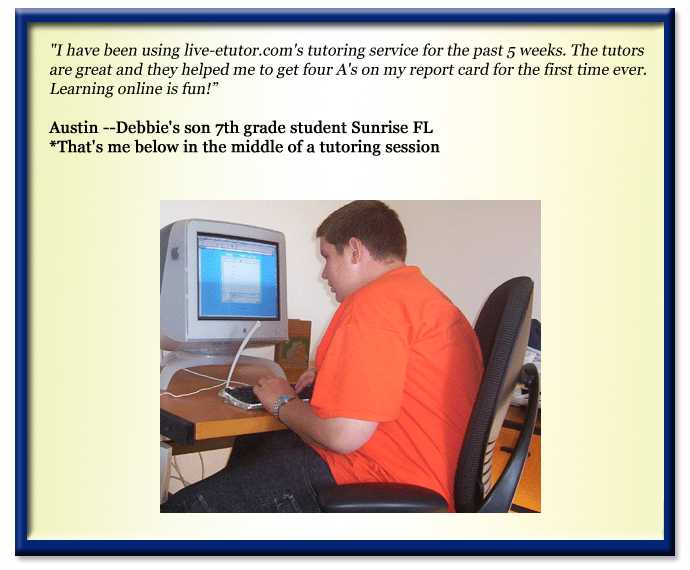 Because we only work with tutors who operate their own online tutoring practices with the support of TutorFi. After each tutor goes through our extensive training and comprehensive certification process, then and only then are they given our seal of approval to run their own online tutoring business with TutorFi. This ride as been fun! I am living proof that hard work pays off. TutorFi is the first ever true win/win/win for parents/students and tutors & I am quite proud. My next big goal in life is to open up Donating For Kids a non profit organization here in Colorado where I hope to make my dream a reality soon (check out my business plan here). When your time is short and you’re overworked, let my team of certified TutorFi tutors handle the tutoring of your child. Your tutor will personally consult with you about your child's learning needs. They'll ask questions and gather information about your child. You'll talk about his or her challenging subjects, personality, habits. Your tutor usually ends up taking a lot of notes. You may too. We put a lot of thought into matching your child with the right TutorFi tutor. It’s worth our time to select an educator with the right skills to help your child grow. We will ensure your tutor works out an individualized plan to give your young one exactly what they need. Our tutors are screened and cleared to teach only after passing criminal and child abuse background checks. I know you can’t be too careful these days. Instill the high performance mindset of top students… eliminating mental blocks your son or daughter may have. Motivate your child firmly with positive feedback and boost self image. Work with your child's current abilities and fortify skills, habits and confidence. Tutor any subject they need, Math, Algebra, Geometry, Science, Chemistry, Physics, Language Arts, Social Studies, English, History, College level and more...Grades K- College. Help complete homework so your child absorbs lessons like a sponge while getting nothing but high test scores. Turn “potential” into tangible improvements on report cards. No more tension about grades! The way we designed the program to work is based on your child’s unique needs. We don’t believe in a cookie-cutter approach to tutoring… because we know your son or daughter is an individual. We'll cater to their specific requirements, designing a unique high performance plan. We tap into their current love of entertainment in a whole new way. With our specially designed system, your child is guided by a hand-picked tutor in a dynamic multimedia environment. There's plenty of proof that supports why our concept works so well. According to Don Menn of San Francisco State University: "...interactive multimedia--properly developed and properly implemented-- could revolutionize education." According to R. Mayer (Educational Psychologist, 2009), "When applied to multimedia learning, generative theory presumes that mixed modes of delivery (text, graphics, audio, video, animation, etc.) affect the level at which learners employ cognitive processes to acquire knowledge." Picture your child using the computer they already associate with pleasure... to boost their grades and confidence. They'll actually look forward to sessions. And as a parent, you'll be thrilled. 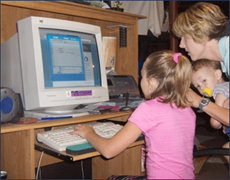 Your son or daughter gets two-way communication with their tutor over the Internet. When they have a question... all they need to do is ask! It's just like talking to them on the phone... then we layer on the visual element. They tap into cutting edge whiteboard technology... so they can draw or type in any color they wish. Math and Chemistry problems are a breeze to work on. Think of it as a "virtual chalkboard" that adds a visual component to the learning process. Each session can be printed out, so your child can review the material too. It's just like working side by side with your tutor. Only more fun! Our system works for anyone! Whether you are on Comcast, AT&T or... any Internet service provider and any browser. Even if you're on a dial up connection... our system still works fast! Visual learning strategies help students process more information. It helps students organize information easier... and stimulates their creative thinking. By adding the auditory component, we create a more multi-sensory environment that boosts concentration. I have tutors who specialize in kids with learning challenges. They use the most current strategies. Many of these kids are gifted with high intelligence but do not yet know how they learn best. We will make them aware of their strengths and weaknesses and get them focused and excited about learning. 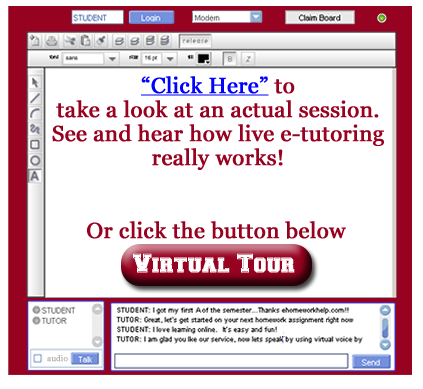 As you can see... online tutoring with a TutorFi tutor works. This is only a fraction of the notes we get from parents and students! So what are you waiting for? Good grades are right around the corner! Yes Scott , I want my child to get one-on-one tutoring! We are so committed to delivering on the promise of a fun and effective learning environment... we are throwing bonuses for giving us a try. I am confident once you try a session with a TutorFi tutor, you'll gladly enroll your child into a monthly tutoring program and watch in amazement as they are transformed into the straight A student you always dreamed of. After signing up, you'll immediately get a call from your TutorFi tutor. You'll get to know each other and you can share some information about your son or daughter. Have a pen and paper handy, they'll give you some ideas you'll want to remember. After the initial tutoring session, your tutor will consult with you again...after me or someone on my staff have a chance to de-brief the tutor. You'll talk about some strategies to improve your child's weak spots...and how you can continue using us... if you like. If you do decide to enroll your child into a monthly program, rest assured that you'll hear from your tutor frequently. Your child will learn at a faster rate than you thought possible. 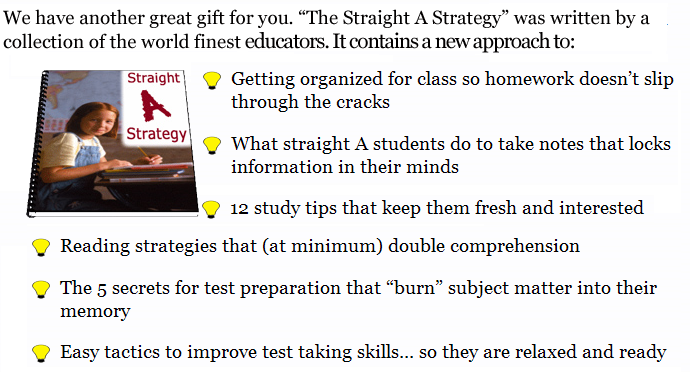 This special workbook is the direct result of a one year collaboration between teachers and straight A students. The study focused on top students study routines... and what separated them from "average" students. Your child will complete the evaluation on his or her own. Then they will understand how to study more efficiently. Once your child understands this... it's common to be able to do homework in half the time! Your youngster will immediately have feedback to lay the foundation for speedy improvement. You can give your youngster this gift for his or her future by taking advantage of this special trial offer. Professional tutoring can run as high as $150 per hour and we actually have tutors that charge this much on their own. We realize that's out of reach for many of us (especially in today's economy). Some tutoring chains make you sign a long term contract, locking you into paying. Even if you don't need them anymore. It can run into thousands. The main reason you should sign your son or daughter up right now is because no one cares like we do! This type of service is very hard to provide, but since we personally train all TutorFi tutors, you're guaranteed to get a qualified, caring and screened tutor. I want you to know how much I value the opportunity to see your child improve grades, attitude and confidence. Your child's academic success means so much to me that I am going to make you an offer you can't refuse. Before you get to excited about enrolling your child, there is a chance you'll have to sign up for a waiting list. Because of the shear demand of our TutorFi tutors, we can't certify them fast enough. To find out if there is availability, click here. How Certain Am I That Your Child Will Get Results? I told you earlier that I don't believe in cookie-cutter solutions. I want you to feel 100% comfortable that your child will improve study habits, attitude and grades. So I offer a guarantee unlike any other tutoring service. You pay only $35 and if you don't feel your TutorFi tutor gave your child more than you ever expected, you get a complete refund and you keep the $296 in bonuses! It’s a loving investment in your child’s future, and a decision that opens up a whole new world of possibilities for your son or daughter. The best part is...you have nothing to lose! Yes, Scott - Sign Me Up For A 1 Hour eTutoring Session! P.S. That’s right; you can try us out on our $35 introductory offer and if you don’t like what we do for your child, you lose nothing and you get to keep $296 in bonuses!